Home / Unlabelled / Sentencing of Killers of Benue Catholic Priest to Death by Hanging: Bishop Ezeokafor Hails Makurdi High Court. Sentencing of Killers of Benue Catholic Priest to Death by Hanging: Bishop Ezeokafor Hails Makurdi High Court. 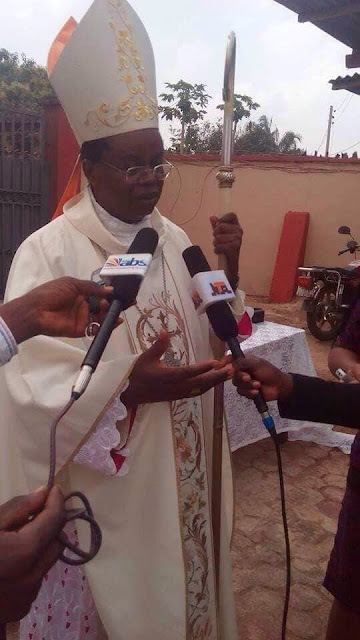 The Catholic bishop of Awka Diocese, His Lordship Most Rev. Paulinus Ezeokafor, has hailed the Makurdi High Court for bringing to book the two surviving kidnappers and murderers of Vicar General of Catholic Diocese of Oturkpo, Benue State, Rev Fr John Adeyi, PhD. The Court in its ruling today sentenced the murderers to death by hanging. Reacting immediately the news of the judgment filtered in at St. Patrick's Catholic Cathedral, Awka, Bishop Ezeokafor expressed mixed feelings over the outcome of the judgement, noting that the Universal Church never liked or supported any form of killing, adding that in this case, the Church had no choice than to allow the long arm of the law take its cause. 'We are happy that the murderers have been caught and tried. In other hand, we are not entirely happy about the ruling. We, as a Church, never wish anyone dead. What we do, is to pray for sinners to repent even though the death of our Priest caused us serious heartache and pains. We are quite sad seeing this. The Catholic Prelate ceased the opportunity to called on Nigeria's youths to shun crime and criminality, saying that the present Court ruling called for sober reflection. 'So much lessons to learn from this judgment. The major lesson any discerning mind will take from this judgement is that crime does not pay. Why engage in crime? Why take someone's life? Why destroy what you cannot create or produce? ', Bishop Ezeokafor asked. Father Adeyi, before he was kidnapped and subsequently murdered in 2016 by unknown gunmen was the Vicar General of Catholic Diocese of Oturkpo. The Cleric after his kidnap was later killed and his body dumped in a farm near Otukpa. According to report, four of the kidnappers were arrested by A team of the Nigerian police led by ACP Abba Kyari few months after. In a verdict on Wednesday, the court found the two surviving suspects guilty and handed them death by hanging. Reacting to the judgment, the family of the late cleric in a statement made available to newsmen, described the court’s verdict as justice at last. 'Today being 25/07/2018, the kidnappers and murderers of Fr John Adeyi have been convicted and sentenced to death by hanging by a High Court in Makurdi. 'While applauding the judgement and thanking God and all those who made this come true, we must say that today is a sad day to be reminded of the brutal death of our dear Very Rev Fr John Adeyi, PhD. 'It is gratifying, however, to know that the culprits did not go unpunished.